It’s been bloody hot the past few weeks. There were a few days when things cooled down a bit and I felt I could catch my breath, but otherwise I’ve been “perspie” as my Grammy Thompson used to say. “Perspie” was her delicate way of saying perspire. Since we don’t have air conditioning I’ve come up with four great ways to beat the heat. 1. Clean your basement. Seriously, the basement is always cooler than upstairs. I’m not talking heavy lifting, just some rearranging, a few loads of laundry. You’ll cool down and be happier. Heck, just tell everyone you’re going down to clean the basement and instead grab a folding chair and a good book and read for a while. 2. Find a Swimming Hole. This tip is for folks in the country. There are several near and far from me (unfortunately nothing within walking distance). What you’re looking for is something on the icy side so you can bring your core temperature down. Don’t forget to put an extra towel on your car seat so you don’t fry your bottom when you leave. 3. Turn on the Brooklyn AC. When I lived in Brooklyn there were no swimming holes, and we couldn’t afford the electricity an AC unit sucked down so we made our own AC. First set up a chair with a towel on it. Beach or bath it doesn’t matter. Second position an oscillating fan in front of your chair. Third grab all the bandanas you own and soak them in cold water, wring out most but not all of the water. Fourth strip naked. Then sit on the chair, place the damp bandanas all over your body and turn the fan on high. It will feel like you have AC. Re-wet the bandanas as they dry. 4. Make a pitcher of ice tea. I covered the basic concept for ice tea here. 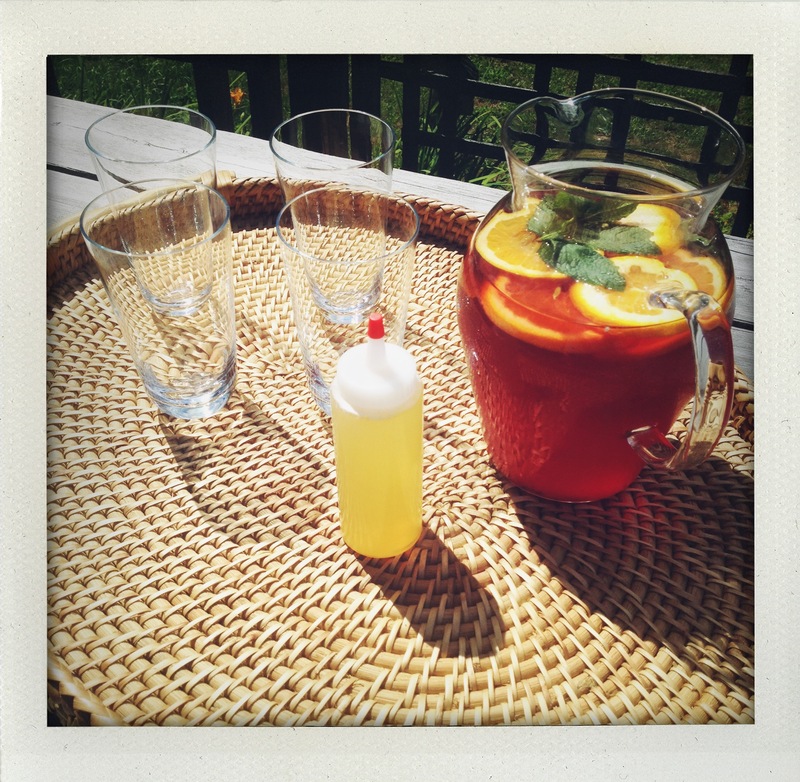 My friend Hilary Zaloom made this divine ice tea for our monthly knitting group when we were crazy enough to meet during a similar heat wave last summer. We ended up at Hilary’s house because she has AC (and not the Brooklyn kind) and she also makes the most delicious drinks. Needless to say between the beverages and the AC we were all happy to sit there for several hours chatting with a bunch of wool in our laps. The genius of this ice tea isn’t just in the flavor combination, but in the sweetener. Instead of using a simple syrup (one part water to one part sugar) Hilary adds honey and some warm water to a squirt bottle. Once shaken to combine the honey water can be squirted into any cool beverage as a sweetener without clumping as it is want to do in cold drinks. Brilliant! Place teabags in a large pitcher of water and let soak 3+ hours or overnight. Remove bags and add mint sprigs. Slice half the orange and juice the remaining half. Add juice and slices to the tea. Sweeten to taste with honey water. *Store honey water in the fridge if you don’t use it immediately, it will keep for a week or so. 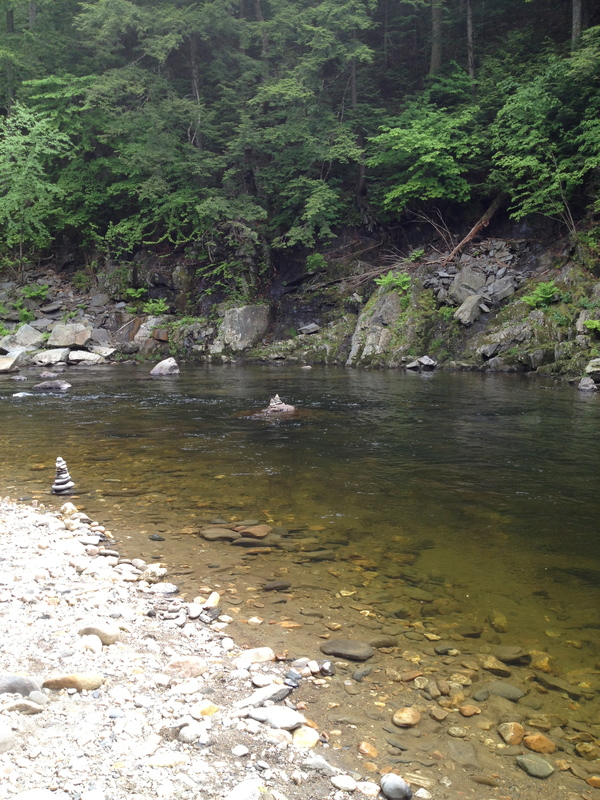 I’ve been plenty “perspie” lately and our favorite swimming hole is too low for lack of rain. Care to share and meet at yours some time? I will definitely take you there! My mom would have been “horrified” 😉 at the idea of a lady perspiring. She’d say, “horses sweat, men perspire, and women glow.” Oh, how I wish I only glowed. I sweat!